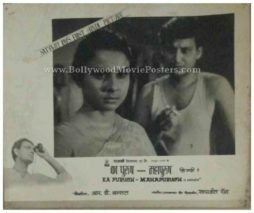 Rare surviving set of vintage Satyajit Ray movie stills of the Bengali movie Kapurush O Mahapurush (1965) for sale. This is an actual surviving set of old Satyajit Ray movie stills of the 1965 film Kapurush O Mahapurush that was written and directed by India's finest filmmaker. 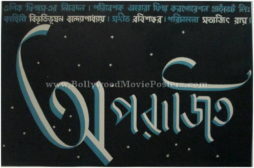 Music for the film Kapurush O Mahapurush was composed by Satyajit Ray himself. Kapurush O Mahapurush is believed to be Satyajit Ray's first Bengali film to be dubbed and released in Hindi, making this set of old Satyajit Ray movie stills highly collectible! Printed and circulated a few years after the original Bengali release of the film (late 1960s), this set of eight Satyajit Ray movie stills was printed for publicity of the film inside a cinema hall. These old black and white Satyajit Ray movie stills were actually used inside a cinema foyer that screened Kapurush O Mahapurush! The corners of this Satyajit Ray movie stills set display visible pin hole markings – tell tale signs of being pinned on the notice board of a movie theater. 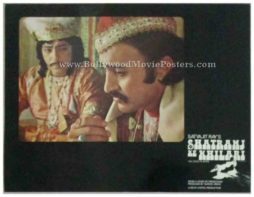 Very rare, original vintage Satyajit Ray film poster of the critically acclaimed Bengali film Agantuk – The Stranger (1991) for sale. 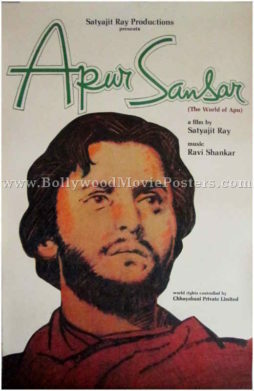 This is an actual surviving publicity film poster of the last Satyajit Ray directorial masterpiece, Agantuk – The Stranger. 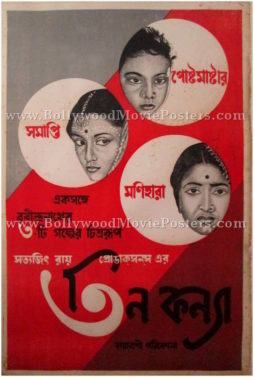 Agantuk was the last film directed by Satyajit Ray, who is unanimously regarded as one of the greatest filmmakers in the world, making this poster extremely collectible! 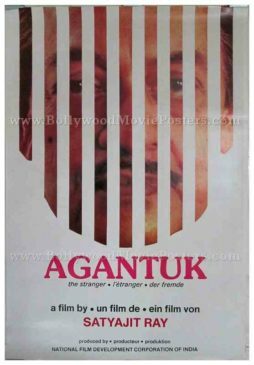 Agantuk (sometimes also spelled as Agontuk) is a Bengali drama based on a short story written by Satyajit Ray called Atithi (The Guest). It was a joint Indian-French production, funded by Gérard Depardieu’s DD Productions and Canal+. Satyajit Ray died in 1992 at the age of 70, leaving behind his final masterpiece, Agantuk. 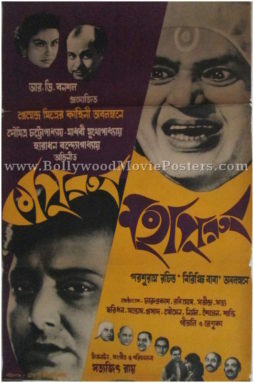 Printed and circulated during the release of the film (somewhere in the early 1990s), this artistic old film poster was originally designed for publicity of the Satyajit Ray masterpiece but never ended up being used. 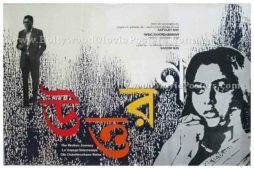 This Indo-French release Satyajit Ray film poster was printed on high quality glossy photo paper, and duly credits Satyajit Ray as filmmaker. 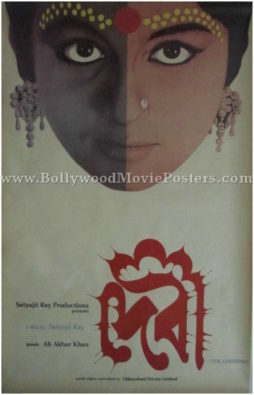 Agantuk (The Stranger) is a 1991 Bengali film directed by master filmmaker, Satyajit Ray. 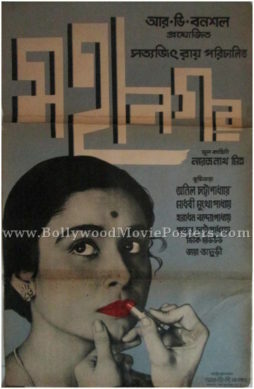 Based on one of Satyajit Ray’s short stories, Atithi (The Guest), Agantuk was a joint Indian-French production and the last film to be directed by Ray. The film bagged several national awards and is widely regarded as one of Satyajit Ray’s finest films. 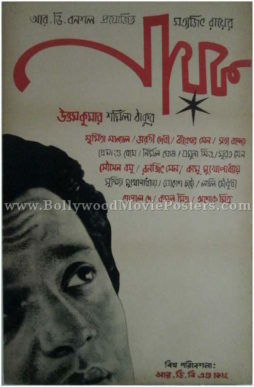 Very rare, original Satyajit Ray movie poster of the Bengali film Uttoran – The Broken Journey (1994) for sale. 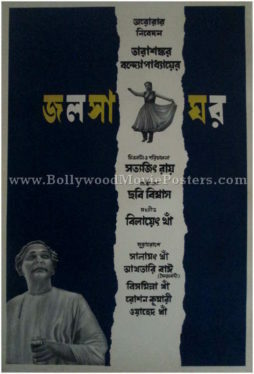 This is an actual surviving vintage publicity poster of the Satyajit Ray masterpiece, Uttoran – The Broken Journey. One of the greatest filmmakers in the world, Satyajit Ray wrote the screenplay of this fabulous Bengali drama which was directed by his son Sandip Ray. The film was screened at the 1994 Cannes Film Festival, making this poster highly collectible! While writing the screenplay for Uttoran, master filmmaker Satyajit Ray is reported to have planned the direction of the film in meticulous detail, including casting as well as shortlisting locations for the film. Due to ill health and his subsequent demise, Satyajit Ray was unable to direct the film, and the baton was passed to his son Sandip Ray. Printed and circulated during the first release of the film (somewhere in the mid 1990s), this artistic old Satyajit Ray film poster was originally designed for publicity of this Satyajit Ray masterpiece but never ended up being used. 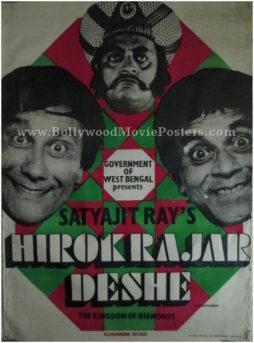 This Indo-French release poster was printed on high quality glossy photo paper, and duly credits Satyajit Ray for the screenplay. Uttoran The Broken Journey is a 1994 written by Satyajit Ray and directed by his son Sandip Ray. It was screened in the Un Certain Regard section at the 1994 Cannes Film Festival. The film was well received and praised by critics across the world.